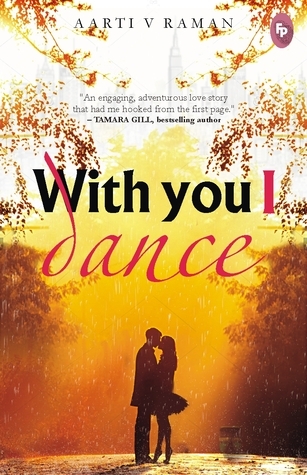 THE WRITING BUDDHA - Opinions | Books | Movies: With you I dance by Aarti V Raman (Book Review-2.5*/5) !!! With you I dance by Aarti V Raman (Book Review-2.5*/5) !!! There are few authors who become your favorite with their first book itself. The case of Aarti V Raman is the same. Her book "Kingdom Come" was so terrific and thrillin that I couldn't believe for days that a female author have written it. Since then I waited for her next book and finally I got my hands upon her latest book "With you I dance" published by FingerPrint Publishers- one of my favorites. The cover page of the book is so delightful and pleasing that you can't move ahead without glancing a look at the book. The book is basically about a girl who couldn't perform on one of her biggest days of life because of which she loses all the determination and will power in life due to which she leaves New York. She returns back to India only to find the boy whom she left behind in New York without giving any explanation through a common friend, Zoya. Aarti has a brilliant command over the language because of which she makes every sentence of hers a story in itself. The most that I like about her writing is the conversations that take place between several characters. She just gives life to the characters through the dialogues she gives them. The first half of the book is exciting as you want to know in which direction will the protagonist move ahead in life. Her introduction with Zoya and Abeer makes the whole premise very interesting. The second half is more about the confusions that takes place between these three friends and how Meera, the protagonist, finds it hard to prove herself right to each one of them. The chapters are nicely divided and I liked the fact that Aarti didn't expand the scenes unnecessarily. Writing a short book after writing something like Kingdom Come shows her maturity to treat different stories in their respective flavors. Talking about the drawbacks of this book, I would say that I didn't find anything new in this one. Because of her previous book, I had big expectations from this one but it wasn't any close to her own standards. It's just a light read and you won't find exciting twists and turns happening but everything keeps moving in the same flow. In the end, you would be disappointed to read such a plain stuff which could have been treated in a much better way. I give this one just 2.5 stars out of 5. I hope Aarti Raman will bounce back with her next work.